Bosworth Charkhas are available exclusively from us. "As far as charkhas go, the Bosworth Charkha wins hands down!" Our unique spindle mount allows you to set the angle to what works best for you: the traditional downward pointing spindle can easily be converted to a more contemporary horizontal spindle in just a few minutes. The magnetic spindle mount holds your spindle firmly in place during use, and the spindle can be easily removed with a simple push of your finger. Each Charkha comes with 3 spindles. Extra Standard or Plying Spindles are available at $15 each. All of our Charkha spindle tips are rounded for your safety. There is no disassembly required to close the case — just release the spindle mount, remove and store your spindles, align the turning knob on the wheel, close the case and go! The Journey Wheel Attaché Case Charkha is large enough to stay in place without being clamped down for spinning. The two large lockable storage compartments will hold your spindles and fiber. The Bosworth Attaché Case Charkha is in regular production and comes with 3 spindles, a built-in lazy kate, a skeinwinder and yarn guide, and 2 lockable storage compartments. “Spin Left, Draw Right”: As a special order, the Attaché Case Charkha can be made “spin left, draw right”. There is an additional $195 charge for this. Please contact us for details. Shipping: Domestic UPS Ground Service/insured begins at $30 for an 8-pound package. International packages sent by USPS Priority or Express International with tracking and insurance for an 8-pound package begins at $65 to Canada; $95 to Europe, Asia and Australia. Level of USPS shipping/insurance may vary by country. The Journey Wheel Book-size Charkha fits easily in a tote bag for spinning on the go! 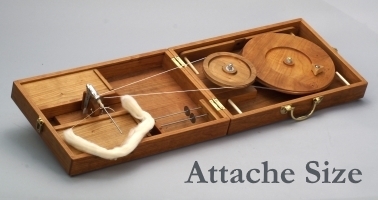 This Charkha’s rubber feet and center lock-open latch gives spinning stability in most circumstances. 20 available in August 2019. 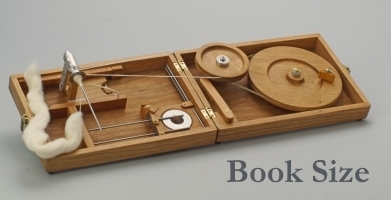 The Bosworth Book-Size Charkha is in regular production and comes with 3 spindles, a built-in lazy kate, a skeinwinder and yarn guides. “Spin Left, Draw Right”: The Book-Size Charkha cannot be made “spin left, draw right,” however it can be turned (spindle away from you) and spun in reversed position. Shipping: Domestic USPS Priority Mail shipping with tracking and insurance for a 3-pound package is $22-25. USPS Priority or Express International shipping with tracking and insurance begins at $55 to Canada, $80 to Europe, Asia and Australia. Level of USPS shipping/insurance may vary by country.